Good credit translates to a major part of a successful future. A positive score can open doors to jobs, apartments, even the ability to turn on your utilities. This is a key time to learn more about how to establish and maintain good credit. 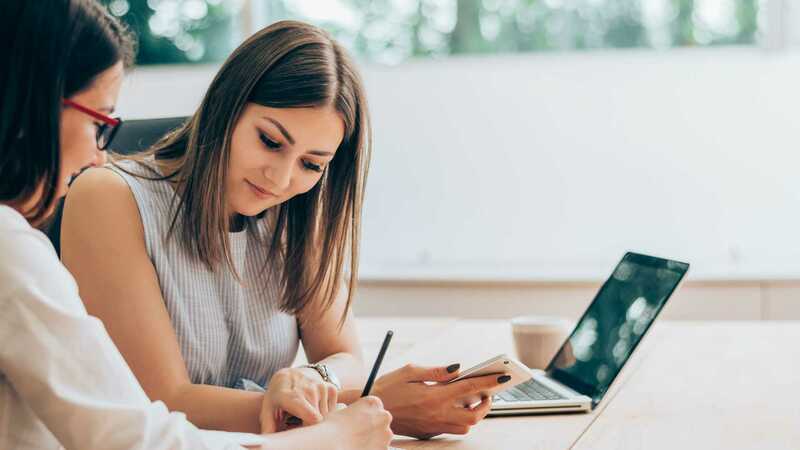 The good news is that just by reading this, you’re already taking the first steps on your journey toward better credit and learning about what it takes to improve your credit score. Feeling as though your credit score could use some improvement? You’re not alone. Research shows that many Americans could use a little help in the credit department. The average American credit score as of September 24, 2018, is 704, which falls just shy of what is considered a good rating. 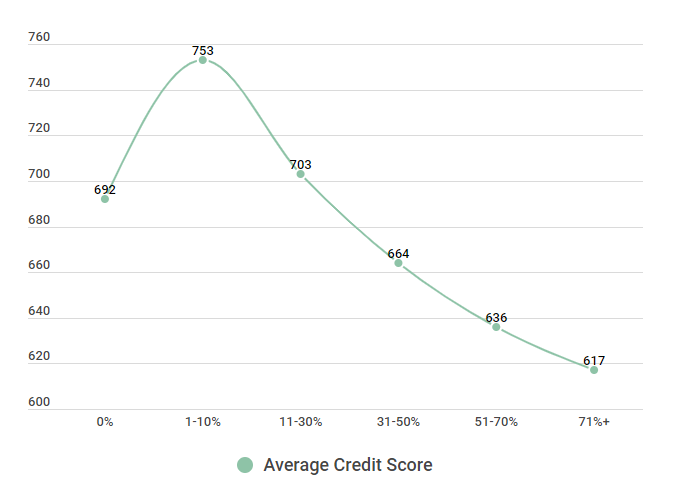 In this article, we’re going to look at different ways you can improve your credit score, hear from some Credit Sesame members on how they improved their credit score, and dive into some of the data behind the strategies. Source: Historical data take from Experian State of Credit 2014, 2016. Current data survey of 2,500 people in the United States on 9/2/2018. Why is improving your credit score important? When it comes to improving your credit, there really is no time to waste. A low credit score may not seem like a big deal until it’s time to leverage your credit for a car loan, mortgage, insurance, and many other big life events. Americans with low credit scores may not be eligible to borrow money for these things or might end up with much higher interest rates than someone with a higher credit score. The earlier you begin working to improve your credit score, the easier it will be for you to accomplish these things. As you can see from the chart below, payment history is the single most important factor when it comes to your credit score. After that comes credit utilization, and the two together make up the bulk of your score. That’s not to say you should ignore the other factors at work, but understand that these are the major players here. Do you make late payments? Your credit utilization ratio counts nearly as much as payment history. Credit utilization is the amount of total debt versus total credit limit. Very high credit utilization, or amounts owed, means that your cards may be maxed out. For example, if you’re carrying $3,000 in debt with a $4,000 combined credit limit, your credit utilization ratio is 75 percent. The solution: bring down your balances. The lower your ratio, the better the boost. People with the best credit scores use no more than 7 percent of their available credit. 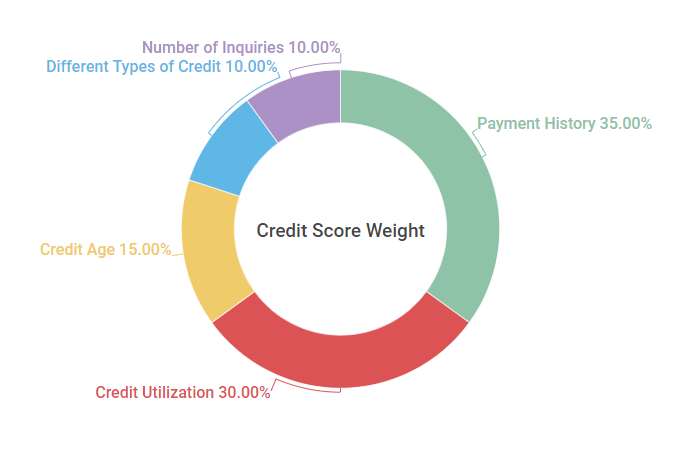 Credit utilization is calculated for each card as well as for an overall tally. Even one tapped-out card can hurt your score. Do you close your old accounts or have only very new accounts? The third factor is your credit accounts’ average age. Since you’ll gain points in this category over time, you generally shouldn’t close old accounts or those you have paid off. Do you only use one type of credit? The next factor is the credit mix. The credit bureaus want to see evidence that you can successfully manage a variety of credit types. For example, student loans, mortgages and auto loans are all installment loans with a fixed payment, but a credit card or home equity line of credit represents a revolving credit with variable payments. Do you often apply for new credit products? Each inquiry into your credit, which is what happens with each credit application, can drop your score by a few points. Soft inquiries–which include employment checks, self-checks, and inquiries to prequalify you for promotional offers–do not hurt your score. Hard inquiries are those made as the result of an application for new credit. Those are the inquiries you need to limit. Think about your answers to the questions above. Each “yes” is a factor contributing to your low credit score. There are a number of ways to improve your credit score, both in the short term and the long term. We’ve gathered our favorite quick tips as well as general advice for improving your score below. You can also join Credit Sesame for personalized recommendations on improving your credit score. Nothing is flawless. Mistakes happen. Error correction is the simplest way to improve your score now. According to the Federal Trade Commission, one out of five consumers has an error on at least one of their credit reports. Don’t let misreported information be the cause of poor credit when it’s relatively easy to fix. Regularly checking your credit report is an essential first step toward improving your score. How can you bring up the number if you don’t know what it is? As you can see from the chart below, those who check their score on a regular basis see the benefits. Source: Historical Data provided by https://consumerfed.org/wp-content/uploads/2016/06/CFA-VSS-Survey-Results_2016.pdf. 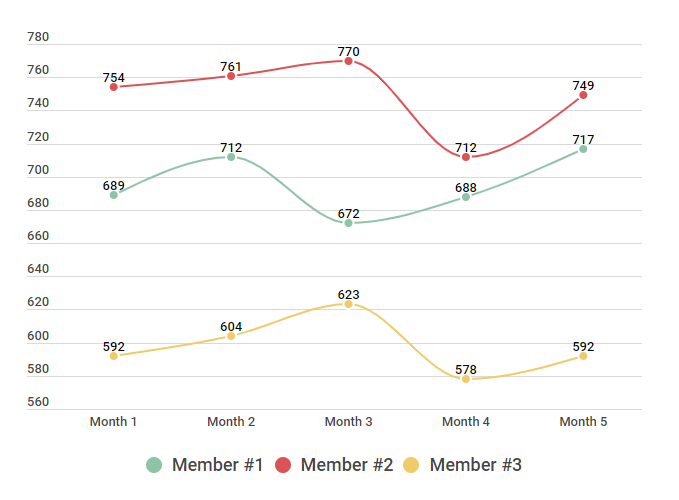 Current Data provided by a survey given to 750 members and non-members over the course of two years, starting 2/15/2016 and ending 2/15/2018. It’s clear from the data that those with higher credit scores are more likely to check their annual credit report at least once a year. Although it’s not the reason of why they have a higher credit score since it’s not a factor it does point to the idea that checking your credit can help you be aware of where you stand and how you can improve it. Payment history is your No. 1 friend or enemy, depending on how you approach it. Since this comprises 35 percent of your score, you can’t afford to ignore it. Instead, make bill payment a priority. If you need to make a schedule, do it. If you need a dedicated calendar for the purpose, go for it. Whatever it takes to get yourself on a strict payment schedule, that’s what needs to happen. Payment history is the most important factor in your credit score. The chart below shows this. You can see that good payment habits are rewarded with higher credit scores. Start today and you’ll soon see the benefits. Source: Credit Sesame polled 400 participants between February 10, 2018, and February 17, 2018. 100 participants were Gen Z, 100 participants were Millennials, 100 participants were Gen X, and 100 participants were Baby Boomers. 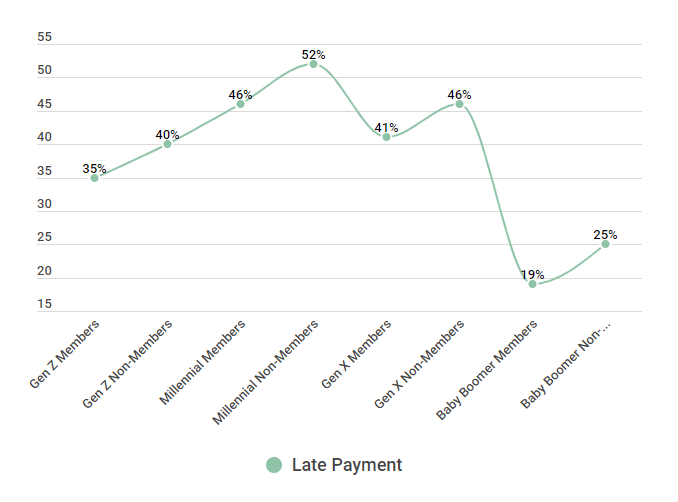 We see that millennials are still struggling to keep up with paying on time. It’s important to set calendar alerts and reminders on your phone to ensure you are paying your bills on time as that is one of the major determinations of your credit score. Source: Based on 3 Credit Sesame members and their credit score before the drop and after the drop (including recovery). You can’t max out your credit cards and still have a good score. You need to keep your ratios low and use as little credit as possible. One way to think about it is that you should only make purchases on your credit card (emergencies are an exception) when you can pay for them out of pocket. Improving your credit utilization is the second most important step toward improving your credit profile. Successful credit applicants and those with the best scores have the lowest percentage of credit utilization in relation to the amount of credit they have. The pattern here is quite clear – don’t overuse your credit or you’ll end up lowering your credit score quite significantly. Just compare those who have an average of 1-10% utilization and a 753 credit score compared to those with 51-70% and a 636 credit score. Being able to apply for new credit or loans will become a lot more difficult once you find yourself in the average of poor credit score range – if not impossible. Your credit mix is another major component of your score. Lenders want to know that you can handle different types of credit products, and look for favorably on those who have several credit accounts open. However, be careful about opening too many new accounts at once. Lenders view multiple applications for credit cards negatively. Source: Survey was conducted on 02/13/18 with a total of 500 responses. Although credit mix doesn’t have the greatest amount of weight for improving your credit score – improving the amount different types of credit you have can give you a decent boost to your credit standing. Having a strong credit mix (variety) will help you slowly increase your credit score over time – it would be as much of a jump as payment history or utilization but every bit counts. Fixing unpaid collections can be yet another major component of improving your score. Proceed with caution here, though, as paying down some accounts in collection will not improve your score but actually reset the clock on how long it will take for that debt to fall off your report. Do your research. 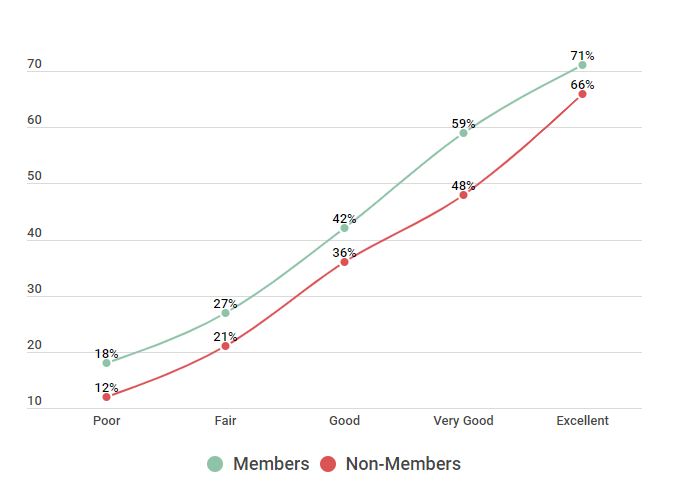 Source: Credit Surveyed 80 people with an Excellent Credit Ranking who reported negative impacts to their credit score over a period of two years between February of 2015 and March of 2017. The numbers represent the average credit score points gained or lost by the stated factors. With excellent credit, your score won’t drop as drastically as those with poor credit who typically have less creditability to lenders. It doesn’t mean however that you won’t take a toll when it comes to credit collections – you can see how on average we found a 113 point drop in 24 months with those who have had credit collections on their credit reports. 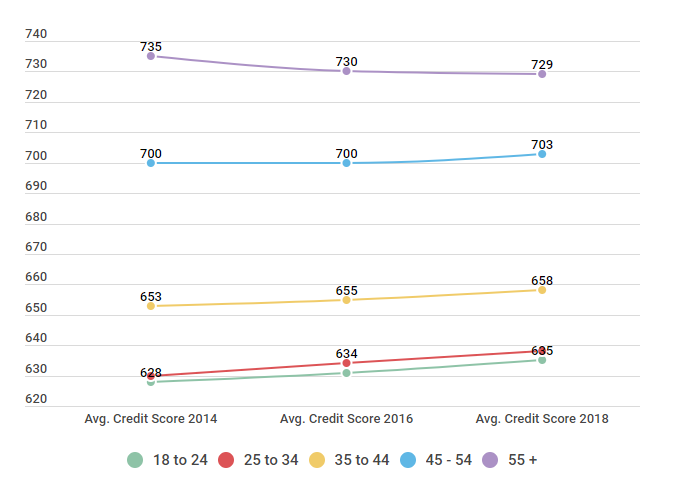 Source: Credit Surveyed 80 people with a Very Good Credit Ranking who reported negative impacts to their credit score over a period of two years between February of 2015 and March of 2017. The numbers represent the average credit score points gained or lost by the stated factors. From the data above we see that collections can be quite detrimental when it comes to hurting your credit score but it is also important to understand that staying away from this negative effect can, of course, sustain your credit score. Sometimes we learn best from those who, like us, have faced adverse situations. Enter our Sesame Stories, in which we offer true cases of people who have managed to successfully improve their financial situations. User Story: Joe A. is just starting to improve his credit. We interviewed Joe A. on September 10, 2018. He is a 29-year-old who works two jobs and has joint custody of his young daughter. He lives in Laramie, Wyo. Q: Explain your credit situation and why you needed to improve it. A: I couldn’t keep up with bills each month because I was working two jobs, paying child support and trying to launch my own business at the same time. I was so busy I’d forget to pay the electricity bill one month and wouldn’t know about it until one day the lights would go out. I know this shouldn’t be this difficult, but it kept happening and I guess my credit score dropped. I also use cash for almost everything, so I didn’t check my score until I wanted to lease a car and the salesman checked it. My score was 590, and he told me I did not qualify. Q: What steps did you take to improve? A: I got organized with my bills and put what I could on autopay, like my water bill and electricity. I didn’t miss any payments for a few months. When my score goes up, I want to open a credit card since I don’t have any at the moment. I probably won’t use it though, but I want to have at least one to build my credit and in case of an emergency. Q: What do you recommend to others who want to improve their credit scores? A: Don’t miss your payments! Set up autopay if you can for the same time each month. Get a starter credit card to build credit and just use a little bit and pay it off each month so you don’t get into debt while trying to improve your score. Regularly checking your credit report is an essential first step toward improving your score. This Credit Sesame user is just starting his path to improving his credit score, and will soon be enjoying the benefits. When it comes to improving your credit, there really is no time to waste. The lower your score, the lower your interest rates will be and the easier it will be for you to obtain credit And the lower your credit score, the harder it is to get low insurance rates, qualify for credit cards, and more. The higher your credit score, the more opportunities you’ll have to reach bigger financial goals. With a little hard work, an excellent credit score rating is within reach for most Americans. If you didn’t manage to absorb all of the details in this tutorial then just remember this – improving your credit is as easy as understanding what affects your credit score. Each of these factors is your path to credit score improvement. The first two make up 65% of your total credit score weight so make sure you are paying your bills on time and keeping your credit utilization below 30%, or better yet, 20%, and you should start seeing your credit improve over time. it was very helpful you guys still didnt show me my credit score the site was shut down can you please open it back up so i can get my credit score. I have received a prepaid master card...is it possible to establish your credit with a prepaid card.